If you are looking for information on the Pinch A Penny franchise business opportunity, Pinch A Penny franchises or Pinch A Penny franchising, then you have come to the right place. Our history speaks for itself. We've grown from one store in 1975 opened by Founder Fred Thomas, to an entire network of stores in Florida, Georgia and Alabama which are now directed by Fred's son, John Thomas. And we're still growing in leaps and bounds due to our diligence in helping franchisees grow their sales and profits. As you'd expect from a family approach to business, we're there each and every step of the way. We train you. Encourage you. Advise you. And give you the resources you need to carry on the Pinch A Penny tradition of quality, reliability and expertise in a fun, family oriented atmosphere. Our company's direction is quite simple. We strive to be unrivaled in providing value, quality and service to our customers. Perhaps that's why we're now 175 stores strong and growing. But we'd also like to think it's because our expertise is something you can count on to keep your pool and spa its healthiest and your family its happiest. In fact, our stores are all staffed with fully-trained people. We have more Certified Pool Operators than any other company in the world and our continuing education programs are unparalleled. So why trust your pool or spa to anyone else? Only Pinch A Penny gives you the answers, tools and products you need to make your pool care routine go swimmingly. Since opening its first store in 1975, Pinch A Penny has become the largest franchised retail pool, patio and spa company in the world. 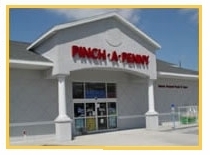 A family-owned business, Pinch A Penny began with the Thomas family opening a discount store within an industrial park in Clearwater, Florida. This first store evolved into a full-time, full-service retail store offering everything needed to operate and enjoy a swimming pool or spa. Pinch A Penny carries a wide variety of products such as chemicals, equipment, patio furniture, giftware, toys, and floats for the pool or beach. The company began issuing franchises in 1976, always promoting its "family-owned" culture. Today, Pinch A Penny is 175 stores strong and growing and provides virtually every product needed to help enjoy a pool or spa to its fullest. The company's meteoric rise proves that knowledge, hard work, integrity and the care and commitment that can only come from such a labor of love is the greatest avenue to success. Consider this. Of the three Southeastern states we operate in, Florida enjoys the second highest number of pool owners in the U.S. Combine that with a strong population growth in the South, a climate ideal for poolside living, and you've got a strong potential for great returns on your investment. How do we know? Because we've done our homework. It's also reassuring to consider that pools and spas need continual maintenance. So not only is our combined market growing, those pools and spas already in place provide a solid base for business.